We are looking for KIND LEADERS who are passionate about promoting and acting as an appointed representative for TKRP. Our Ambassador program is OPEN to Individuals, Youth Leaders / and Volunteer Organizations such as existing Rock Painting Group Members and Administrators. 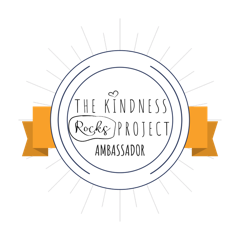 The Kindness Rocks Project Ambassador Program was initiated to create a stronger, more cohesive community with a unified message. Because Individually each one of us can make a difference, but together we can create a real change. Social media by using the Ambassador logo as well as #TheKindnessRocksProject in posts. Website promotion to create more awareness for the project and encourage people to share their stories as they will inspire others. Public event engagements in your community. TKRP Ambassadors are given support from the project and are provided with special TOOLKIT which is full of ideas & applications to use to assist you in spreading the message of kindness in your community. You will receive DISCOUNTS on products such as Kindness Card Packs, Books, and new promotional products that may be introduced. ACCESS to a monthly group Ambassador Conference Call… be the first to learn about and discuss upcoming events and opportunites. If interested please click here to accept our CODE OF ETHICS PLEDGE before filling out your application. *All applications will be reviewed and applicants can expect to hear back within 2 weeks.